Launched in 2010, the Choice Neighborhoods Initiative (CNI) is a HUD-funded grant program that replaces the HOPE VI Revitalization program. 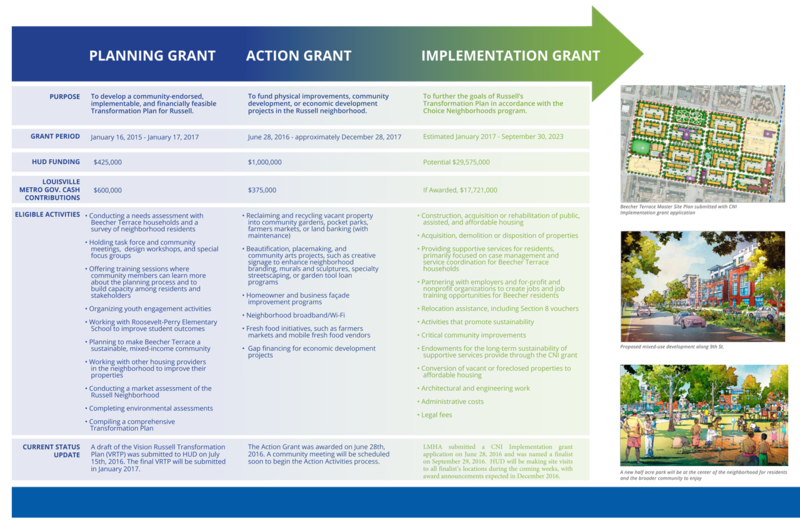 HOPE VI provided funding and support for the successful revitalization of the Park DuValle, Liberty Green and Sheppard Square housing developments into attractive, mixed-income and mixed-use neighborhoods. To transform high poverty and/or distressed communities into viable, mixed-income neighborhoods with access to high-quality services, great schools and early learning programs, and transportation options that provide convenient access to jobs. The Louisville Metro Housing Authority is the only housing authority in the country to receive Choice Neighborhoods Planning, Action and Implementation Grant awards. Full versions of all three applications are available here.